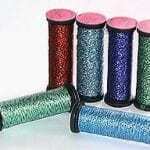 Kreinik carries a #4 metallic which is a very very fine thread, thicker than a blending filament and very popular with cross stitchers. It is useful in needlepoint when you want to overlay a metallic on a stitch but need something lighter than a #8 but not as light as blending filament. We do NOT stock #4 but will be happy to order any colors you desire. Please see the Kreinik website at www.kreinik.com for the colors available. You can return here to order or use the shop link there and order from us through the Kreinik website.